The youngsters got their hands on the trophy following a 4-0 win over Cowdenbeath U20s at Michael Woods Sports Centre in Glenrothes on Tuesday night. And coach Easton was delighted to see his players repeat last season’s success. “It’s a great achievement,” he said. “With the same core of boys we set them a double target and that was, individually, can you get yourself in the first team, and, as a team, can we win the league again? “The individual aspect has probably taken a wee bit away from the team thing this year, particularly as a lot of them are in their second year and want to be closer to the first team. “But at the same time, any game they’ve played they’ve been together as a squad, and ultimately, they’ve achieved what they set out to do, which is amazing. With back-to-back titles secured, Easton is now seeking a bigger challenge for his players with the prospect of a new league set-up in place for the start of next season. Reports suggest that the Development Leagues are to be scrapped in favour of a Reserve League format, which would allow younger players to test themselves against more established first-team pros, rather than facing their own age group in Development League matches. The new proposals would see a ‘Premier’ Reserve League, with an East and West League sitting below the top tier, similar to the existing set-up. 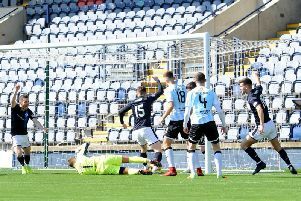 Easton is hopeful that Raith can be ‘promoted’ to the Premier format in order to be tested against reserve teams from the bigger, full-time clubs. “If you’re winning games comfortably in the Development League East it’s not necessarily giving a true picture of where you are,” he said. “You don’t want to stand still and I would love to challenge our boys against the better teams in the Reserve League proper, if that’s possible. That will depend on what happens first team wise. That’s got to come first, then everything falls into place around that. “Ideally that would be the next challenge for them and we’d also be looking at loan deals because they need experience at a better level to move on to the next stage of their development. A number of Easton’s development squad have featured at first team level this season, most notably centre-half Dave McKay, who has made 22 appearances, right back Jamie Watson and midfielder James Berry. All three started the 3-1 away win over Championship frontrunners St Mirren in the Irn-Bru Cup in October. “The gaffer has taken a chance on them and they’ve proved him right.